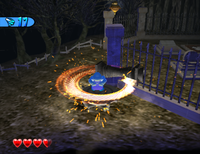 Wario using a Swirly Slab in Horror Manor. A Swirly Slab is a circular platform with a spiral on it in Wario World. If Wario performs a Wild Swing-Ding while standing on it, the Swirly Slab will rise, giving Wario access to higher areas that would have been inaccessible otherwise. Swirly Slabs first appear as metal disks in Horror Manor, and reappear in Beanstalk Way, where they are hidden within flower buds that must be Ground Pounded to be opened. Wario using a Swirly Slab in Beanstalk Way. Wario about to open a closed Swirly Slab in Beanstalk Way. This page was last edited on January 14, 2019, at 23:12.